The Crouch End Arts Festival began on Friday and I couldn’t wait to get stuck in to as many events as I could over the weekend. 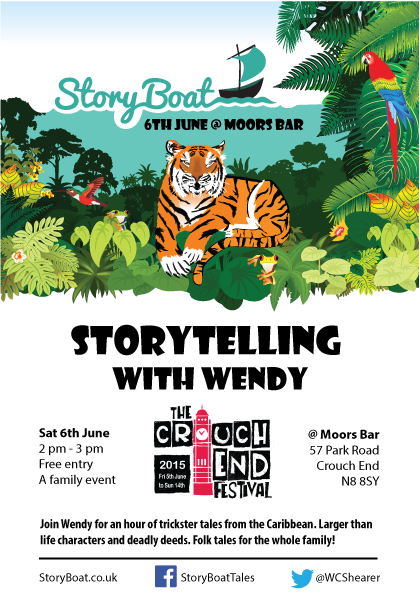 My Caribbean storytelling session took place on Saturday at Moors Bar. 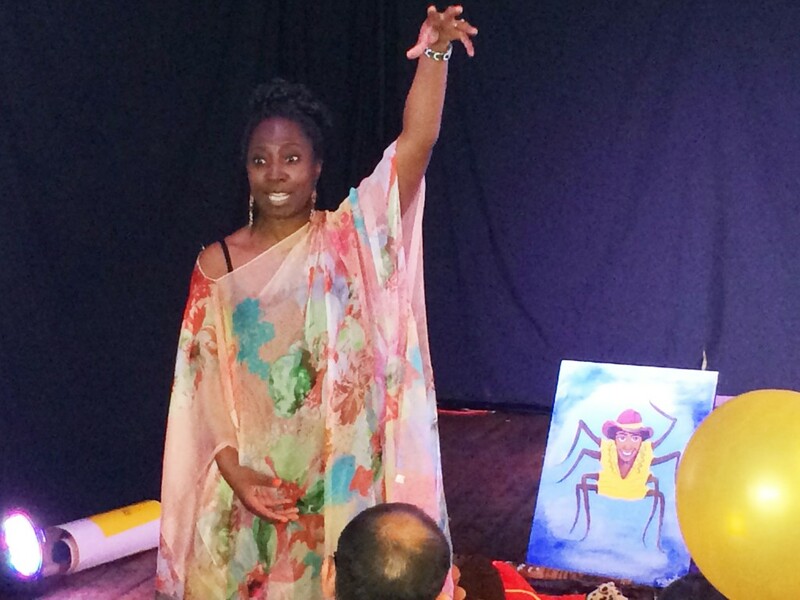 I told a couple of Caribbean folk tales which I’d adapted to include Guyanese folklore stories. Although Guyana is in South America it is considered part of the Caribbean region. My parents and Grandparents were born there and so I’m very familiar with the culture. Many myths and legends have been retold to me during my childhood here and during visits to Guyana. When I was preparing which tales to tell, I really wanted to experiment with different styles of storytelling to reflect the landscape of Guyana and the nature of the people. I set my first tale in the heart of Essequibo territory (which is where my father was born) and described the interior highlands and magnificent Kaieteur Falls. This beautiful waterfall is on the Potaro River in central Guyana, located in the Kaieteur National Park. It empties out into the Essequibo River. In an attempt to share scale and strength, my story had the Essequibo River rising up and overflowing onto the banks. It is after all, the longest and widest river in South America. One of the characters in my story was a malevolent spirit called a ‘Duppy’ or as we say in Guyana ‘a Jumbie’. So how do you take on the characteristics of a Jumbie? Well mine was extremely tall, with very long arms and legs. As I was wearing a floaty long dress I think I was able to imitate an evil spirit! One of my stories included a fierce tiger but I made him toothless. He was called the ‘no-toot tiger’ so that everyone could join in with his name. I also had a really long snake who we called ‘laaang laaaang snake’. Although the characters were scary and intimidating, they had comedy names. This, coupled with a sprinkling of my Guyanese dialect was an attempt to reflect the familiar way Guyanese people can make a joke or smile in the face of adversity. I think everyone enjoyed listening to some Guyanese folklore and taking part in the storytelling. Andy who runs Moors Bar was also a great host, letting me use his venue to take part in the Crouch End Festival. 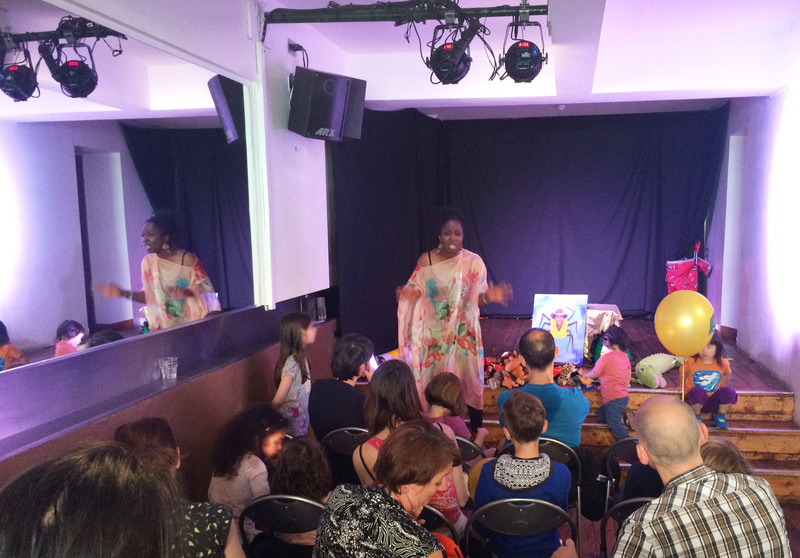 The Crouch End Festival is jammed packed with so many events to see and I started by taking my daughter along to Pickled Pepper Books Shop to take part in a storytelling and crafts workshop run by Rebekah from Spinning Top Tales. Rebekah’s retelling of Goldilox and the Three Bears was adapted to GoldiFOX and the The Three Pears. All beautifully complimented by her hand made puppets and patchwork squares. My other daughter was singing with her school choir and other local schools in-front of the Hornsey Town Hall. Just before that, we clapped and danced along with Hornsey School’s Steel Pan group. It’s been a lovely weekend and great start to the Crouch End Festival.